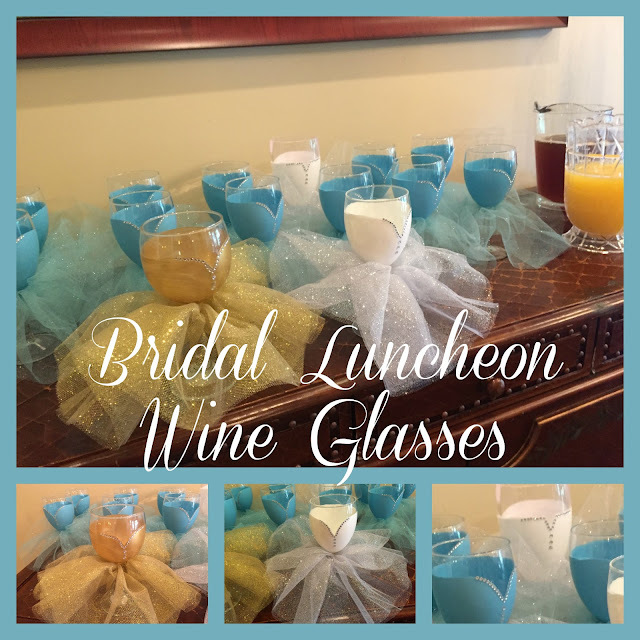 Recently, I hosted a bridal luncheon for my best friend's daughter's wedding with several other good friends!! It was a blast! I saw these adorable bridal luncheon wine glasses on Pinterest! And, HAD TO MAKE THEM for the shower! But, I couldn't find any really good instructions on how to make them. I thought you might appreciate having instructions on how I made them. And, since I'm the kind of crafter that tries to find the most efficient and easiest way to make things, I think you'll like how I did these! I had a good many to make...there were 10 bridesmaids, the bride, the flower girl, and the mother of the bride who were attending the shower. I had to make these quickly and the steps ended up being very easy!